The London Gazette , front page from Monday 3–10 September 1666, reporting on the Great Fire of London. (Click image to enlarge and read). The London Gazette is one of the official records of the British government, and one of the most important in the UK. The London Gazette claims to be the oldest surviving English newspaper. It was first published on 7 November 1665. It is not a normal newspaper with typical news stories. The London Gazette is still published each weekday, except for Bank Holidays. The Gazette is being digitising and records between the years 1752–1998 are online. The London Gazette, dated 14-17 May 1705 detailing the return of John Leake from Gibraltar after the Battle of Cabrita point. The London Gazette was first published as the Oxford Gazette on 7 November 1665. Charles II and the Royal Court had moved to Oxford to escape the Great Plague of London, and courtiers were unwilling to touch, let alone read, London newspapers for fear of becoming ill. When the King returned to London after the end of the plague the Gazette moved too. 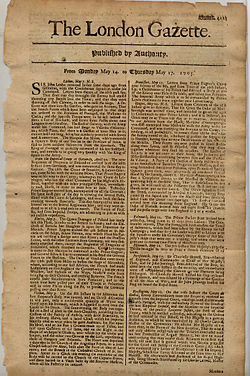 The first issue of the London Gazette (labelled No. 24) was published on 5 February 1666. The Gazette was not a newspaper in the modern sense: it was sent in manuscript by post to subscribers. It was not printed for sale to the general public. Being "gazetted" (or "in the gazette") sometimes also meant becoming bankrupt. Notices of engagement and marriage also used to be published in the Gazette. This page was last changed on 27 July 2016, at 19:21.